One of the items still left on my bucket list is Quebec, Canada. I don't know if I want to do a cruise or a road trip. I guess when the time comes, we'll know. But exploring the options is half the fun and I've been surfing the web for some information. One of the sites said that a trip to Quebec isn't complete if you don't indulge in poutine. Poutine? I looked it up. 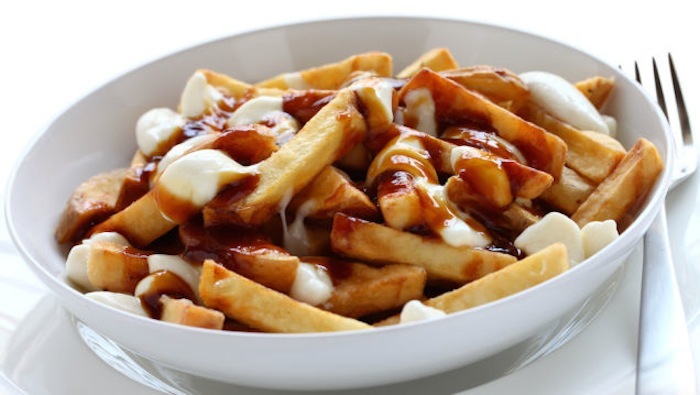 Poutine is a dish of fries, cheese curds and gravy. Um. Really? I once had a friend who loved white vinegar on her French fries. She claimed that was the way they ate fries in Canada. Maybe she hadn't been to Quebec. My grandson loves malt vinegar on fries--lots of malt vinegar. He never claimed to have originated that idea from Canada though. Well, I don't mind trying things--once. I don't see myself eating them more than that but perhaps my mind and taste buds will be changed. Who knows? I found several recipes but haven't decided if I want to try making it yet. Apparently you need to buy cheese curds that squeak when you bite into them and your fries need to be crispy on the outside and soft on the inside. The gravy must be beefy but not overpowering. On second thought, I'll just wait until we get to Quebec and try them from someone who knows what they're doing.